Stewart, Out-Of-Town Group Attack Anti-Blight Ordinance…..Scholarship Honors Kay Davis…2012 Calendar Update…. A strengthened anti-blight ordinance, proposed by Mayor O’Brien and recently adopted by the Common Council, came under attack last week from the leader of a Waterbury-based landlord group and former Mayor Timothy Stewart. The ordinance imposes stiffer fines ($250 per day) on absentee owners of abandoned properties which ,in the most egregious cases, have been unoccupied for years. Opponents, including Stewart and Republican Town Chair Dwight Blint, pinned the blame on tenants in published remarks last week despite the existence of a state law that protects landlords from damages caused by tenants. The Connecticut Property Owners Alliance based in Waterbury is orchestrating the campaign against the O’Brien administration’s efforts to fight blight. We have several serious concerns with the proposal and we need to address the issue immediately as we are all against blight but the new ordinance blames absentee slumlords as the cause, a term most offensive to all urban property owners and does not mention tenant damage, the most common cause of blight at all. Taken literally the Alliance is asserting that “absentee slumlords” don’t exist. This position ignores the reality that some absentee owners or the companies that hold title to the properties get tax breaks for their neglect, driving down property values, jeopardizing public safety and hurting responsible landlords. DeCosmo and his landlord lobby apparently favor self policing over any form of enforcement intended to protect both multi-unit property owners and tenants. Blighted and abandoned buildings are assessed for taxes at a reduced amount because they are in disrepair.That means less funding for our local schools and other services. Abandoned buildings result in unfairly higher taxes on people who actually live in New Britain. For too long, slumlords and the owners of abandoned buildings have been profiting at the expense of the people who live in New Britain. This is unfair and wrong, and I am working hard to end it. Former Mayor Stewart, who acquired investment properties in the city during his tenure as Mayor, succeeded in weakening the previous blight ordinance that exceeded state standards in the fall of 2009. The city adopted cosmetic and toothless changes that have had no impact on the blight problem. Stewart also sought unsuccessfully to thwart reinstating a city building commission, but he was thwarted by the Council and a citizen commission was reinstated to provide oversight on code enforcement and life safety issues in multi-unit housing. The next Common Council meeting will be held on Wednesday, February 8th at the Council Chambers, 27 West Main Street. Residents have an opportunity to speak on the blight issue during the public participation session that begins at 7 p.m.
A community service scholarship has been established in memory of longtime Democratic Town Committee member and neighborhood leader Kay B. Davis. The New Britain Branch of the NAACP and the family of Kay Davis have established the scholarship program that will start this year and be available to eligible African American students graduating from high school and planning to attend a post-secondary institution in the fall as full-time students. The amount of the scholarship award(s) is $500 and may be applied to tuition, room, board and books. The Democratic Town Committee will donate $500 to the scholarship this year as the result of a resolution approved at its January meeting. The scholarship criteria includes involvement by student awardees in some form of community service — a requirement that stems from Kay Davis’ continuous work helping others and serving her community. 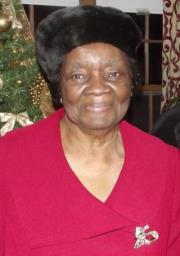 Known to her neighbors, family and friends as “Sister Kay”, Ms. Davis was a faithful and dedicated member of Bethesda Apostolic Church where she also served as the church clerk and organist for fifty years. She was also a member of the NAACP, New Britain Black Democratic Club along with the Town Committee.As President of the Mount Pleasant Residents’ Council, an organization she helped to found, Sister Kay was a soft-spoken but powerful voice for residents and an activist on neighborhood issues. From her Myrtle Street home she helped lead voter registration drives on the DTC and helped promote voter turnout in all the elections and the many terms she served on the Town Committee.To obtain a scholarship applications (due May 31, 2012) interested persons may write to New Britain Branch NAACP Scholarship Committee, Post Office Box 323, New Britain, CT 06050. Delegate Forms Available for National Convention — The Democratic National Convention will be held in Charlotte, North Carolina in the summer and national convention delegate forms became available on Wednesday, February 1st. Romney is not only cold and clumsy, he’s disastrously out of touch, and when talking about real people, out of sorts. If only he had a heart, and if only that heart was connected to his brain. This entry was posted in Housing, Meeting/Event, Tim O'Brien. Bookmark the permalink. 2 Responses to Stewart, Out-Of-Town Group Attack Anti-Blight Ordinance…..Scholarship Honors Kay Davis…2012 Calendar Update…. Blight is blight – it needs to be gone from New Britain. Those who like it can be cordoned off into a corner who enjoy it.